Some background (this is all true): In 1982, hoping to capitalize on the runaway popularity of E.T., Atari negotiated the rights to adapt the film into a video game. These negotiations took so long, however, that it left only 5 weeks to actually develop and code the game. The result was one of the worst video games — if not the single worst — ever made, leaving hundreds of thousands of copies unsold, nearly bankrupting Atari, crashing the entire video game industry, and launching a persistent urban legend that the unsold copies were dumped in a New Mexico landfill. Earlier this year, this legend was proven true. Before this film showed up, I knew the E.T. story, but had not been aware of the Angry Video Game Nerd series on YouTube. Their top posts get somewhere north of 2 million hits, though, so clearly a lot of people are fans. The format is that a guy known as the, yep, Angry Video Game Nerd (AVGN for short) plays and reviews old video games from his youth, going back to the Atari 2600. When Angry Video Game Nerd: The Movie begins, we're inside a corporate boardroom where a young game executive lays out her plan to make the worst video game of all time in order to keep costs low, but get it covered vitriolically by the AVGN, thus ensuring it has a high profile on release and racks up a bunch of sales. The game? A sequel to 1982's fateful E.T., which is also the most requested game review from fans of the AVGN, but he has steadfastly refused to review it. Here's where things get tricky for me in reviewing this movie. Look at the above paragraph. You can see a great set-up somewhere in there. A nerdy guy who has achieved some Internet fame sets out to prove or disprove a 30-year-old urban legend to try to find this game. I could totally get on board with that. Unfortunately, the other part of the paragraph, the whole boardroom thing, doesn't make sense. And it's that direction that the movie takes. Yes, they look for the E.T. landfill, but they do so with the video game exec alongside, posing as a game nerd, and pursued by a crazy general who misunderstands the whole E.T. thing and thinks they're trying to break into Area 51. There are pieces of so many other movies in here, so many cliches, but they're never transcended, so it never reaches the level of effective satire. Ultimately, it feels like the team behind a successful YouTube channel wanted to make a movie, but didn't really know what story to tell, and instead tried to tell the story of every other movie. I don't want to dump on this movie. It was evidently a labor of love by independent filmmakers who should be celebrated for pulling together hundreds of fans from around the world to realize their vision. That's awesome. But in terms of storytelling on an indie budget, it can't hold a candle to other, similarly situated films I've reviewed here, such as the excellent Cinema Six. That said, if you are a fan of the web series, I'm sure it's worth your time to take a look. 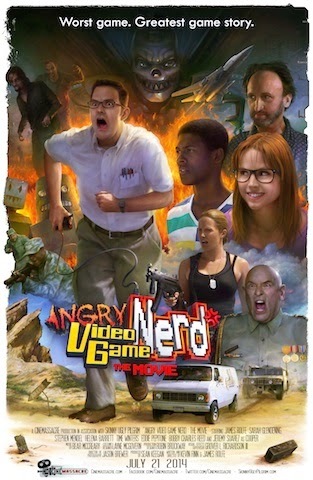 Angry Video Game Nerd: The Movie is available on VOD today. Cult Film Coefficient: 4/10. Problematic, but has its redeeming qualities. Read about our non-inflated scoring system here. Posted by Vance K -- unapologetic lover of terrible movies (well, many of them), cult film and Southern California beer enthusiast, and Nerds of a Feather contributor since 2012.